Every phone sees its share of leaks in the months running up to their launch, but this season with the Pixel has been extraordinary. Both phones are almost entirely in the open. It all kicked off in late May with the leak of a couple purported screen protectors, and that was quickly followed up with a report from Bloomberg a couple days later detailing much of the information that has come to leak out via other avenues since then. But what about actual images and renders of the devices themselves? Here’s a look at every single actual photo and render leak of the Google Pixel 3 and 3 XL so far — all in chronological order. Buckle up, there’s a lot to see here. The two above images were the very first in-the-flesh photos of the Pixel 3 lineup. They are early DVT units sporting the Google prototype logo (as we confirmed). This image was also our first confirmation that “crosshatch”, the long rumored codename, was indeed the Pixel 3 XL. This un-booted Pixel 3 XL also confirmed that a 128 GB storage, 4GB RAM variant at least existed. These images were mostly just more of the same. They actually showed less information than the original ones since the person who leaked them didn’t turn on the device. OnLeaks — otherwise known as Steve Hemmerstoffer — partnered with MySmartPrice to leak out the very first CAD-based renders of the devices. The external design and colors were just a guess at this point I believe, but it was nonetheless our prettiest look at the devices up to this point. The XDA forums were the source for a couple of the first initial leaks, and these were no exception. These photos corroborated the very first leak, showing a Pixel 3 XL with a notch and codenamed crosshatch. This was the first leak of the white model, however, which was significant at the time. It also confirmed the existence of a 64GB model and gave us a more detailed look. And then the flood began. A Ukrainian phone dealer by the name of Binshop on Telegram got their hands on devices, and began to sell them and spread them among Russian media. The first big blockbuster happened on August 8th, when an unprecedented complete unboxing of the white Pixel 3 XL showed up online. This confirmed many more details. The leaks up to this point were pretty par-for-the-course with previous years, but this leak brought with it a fully functional device running pre-release software (which obviously deluged a lot of information), and we got a look at all the goodies in the near-retail box as well. We got to see how Android 9 Pie handled the notch with this leak, many hardware specifications were confirmed like the display resolution and 4GB of RAM, and more. The box gave us a look at wired Google Pixel Buds, the included dongles and adapters, stickers, and more. This leak was pretty much the endgame, and everything that has shown up since has been less exciting or essentially repeats of the same leaks. Official renders wouldn’t come until much later. Following the initial video, another video surfaced from the same source showing more specs. This confirmed camera specs, battery specs, screen size, and more for the Pixel 3 XL. On August 20th, we got our first spy shot! This was the very first leak taken via a shot captured in public — and in this case it happened to be public transit in Toronto, Canada. These images obviously didn’t really teach us anything new, but they did gives us yet another look at the black Pixel 3 XL. They also showed a device with a case — likely one of Google’s own! 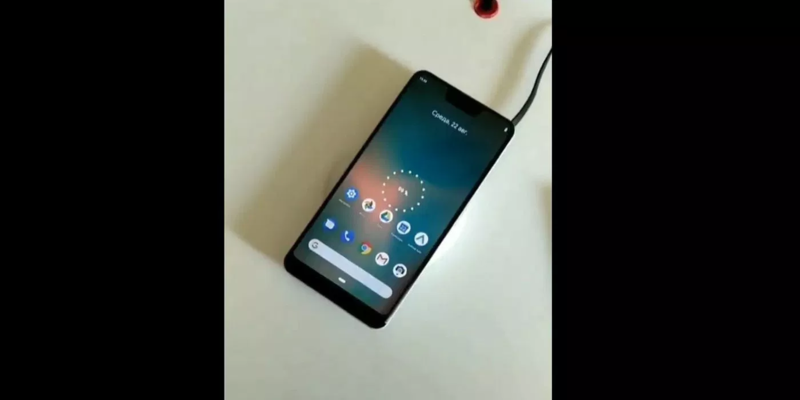 After many requests, a Russian blogger who had previously shared images and video confirmed that, indeed, the Pixel 3 XL has a glass back and supports wireless charging. This leak, on August 22nd, was the most high-quality look at the white Pixel 3 XL up to that point. We got some really nice close ups shot with professional camera gear. While short on information (most of it had already leaked by this point), the galleries of eye candy were extensive here. A day later, the first “review” of the Google Pixel 3 XL showed up on the internet. Of course, this was unprecedented (although perhaps not surprising given the extent of the leaks), and came with a couple more shots. One image showed the Pixel 3 XL next to a flagship Samsung phone. Yet another Russian blog put up a hands-on video with the same white Pixel 3 XL. Again, this was another case where there wasn’t much new info. But if you wanted to watch a high-quality unboxing of the Pixel 3 XL this was yet another option for you. The smaller Google Pixel 3 has managed to avoid the real-life photo leak treatment for a long time, but the time finally came on August 30th. We got to see the non-XL Google Pixel 3 in black with its glass top-third, and much the same physical design of the larger model (sans the notch). The anonymous redditor with this phone in hand also seemingly ran 9to5Google’s own Dylan’s app Inware, which showed many of the phones specs such as battery size, which is 2,915 mAh. September came around, and with it, the Google Pixel 3 XL showed up again. This time, a Google engineer seemingly left their prototype in a Lyft, and the driver quickly popped off the case and posted pictures on the internet for our perusal. At this point, the leaks were getting humorous. A couple weeks later, the first official-looking press renders via nieuwemobiel.nl showed the Google Pixel 3 and 3 XL exactly as we’d seen them in the many leaks up to this point. There was the smaller Pixel 3 and the new, larger Pixel 3 XL that embraces a new notched display. The renders also showed one of the device’s purported official fabric cases. This line of cases launched with the Pixel 2 and Pixel 2 XL last year, and it seems like they’re sticking around — with a very similar design — this year. More hands-on images of the phone surfaced not long after. Nothing new here, really. Yet more renders leaked on September 21st from Evan Blass. These weren’t notable from a content perspective, but they were notable because of their source. Blass has a notorious track record, and this was the leak many would argue finally put the ridiculous Google Pixel Ultra rumors to bed. This is them, says Blass. WinFuture came out just a couple days after Blass with some more renders that looked to be straight out of Google’s marketing assets. These confirmed for the first time that both the smaller Pixel 3 and the larger Pixel 3 XL would both come in black and white and showed us all 4 of those models. On September 27th, another hands-on video showed up via Russian publication Rozetked. This one didn’t bring much new information, but did claim the vibration motor on this device is much better. Another leak on September 27th popped up via some assets in the Google Pixel Tips app. This video gave us perhaps our best look yet at the smaller Pixel 3 in render form. It took a while, but in the days leading up tot he October 9th event, an official render of the Google Pixel 3 and Pixel 3 XL finally leaked out in an additional pink color. This is the color one leakster says is called “Sand,” and just like the Japanese teaser site that preceded it, it has a bright orange accent color on the power button. While the pre-production boxes of the Pixel 3 XL appeared early in the leak cycle thanks to the Ukraine leaks, we didn’t get a chance to see the official retail box for the Pixel 3 XL until October 5th. We didn’t learn much new from this leak, but it does confirm the Google Pixel 3 XL name for the first time in Google’s own writing. Update 10/7: Four more leaks to wrap this up. A new carrier ad out of the UK gave us even more official looks at both the smaller Pixel 3 and the larger Pixel 3 XL. This was our first hint at UK pricing (though not really helpful for interpreting US pricing), and also told us about a new “Top Shot” feature that will probably take a burst of shots at once and choose the best between them using some kind of AI. Also, Home Hub. Again. A carrier out of Canada put their Pixel 3 landing pages up early and gave us yet another look at the Pixel Stand. This was our first look at the Pixel Stand from the front. Also, the site called the “Sand” pink “Not Pink,” which was the first we heard of that. Interestingly, for this carrier, the Pixel Stand is a pre-order gift, which might be a hint that similar will happen with US carriers. Let’s hope so! Engadget did an extensive hands on with a final retail unit a few days before the event. Nothing much else to say about that. Full-res photo and video of the device showed us a likely much better screen than last year, gave us another look at the camera features, and more. We independently obtained even more photos of the Google Pixel 3 XL box, instruction booklets, and a nearly complete list of installed apps. Interesting tidbits here are an adaptive colors mode, the inclusion of the Pixel Visual Core app, confirming the chip is back, and an app for Pixel Stand. A few final leaks flowed out on the day before the event, most notably capped off by some really nice-looking hands-on shots captured by David Imel over at Android Authority.